The Air Force One History Print is a finely produced lithograph. The exclusive photos feature the tail section of this famous aircraft bearing “Old Glory” and the tail number 27000, the most famous tail number in aviation history. 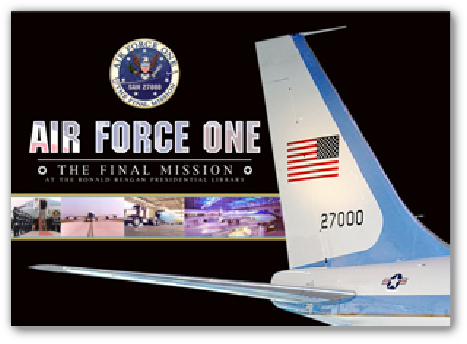 Along the top of the litho and behind the tail, it is emblazoned with the official emblem of Air Force One: The Final Mission, along with all of its patriotic symbolism. The smaller exclusive images show its last flight and significant steps towards its final mission at the Reagan Library in California. The Air Force One history print is a large size, high quality lithograph that is clearly suitable for framing. With its high gloss UV coating and measuring 24” X 36”, this print will fit beautifully in a standard size frame. Printed proudly in the USA.